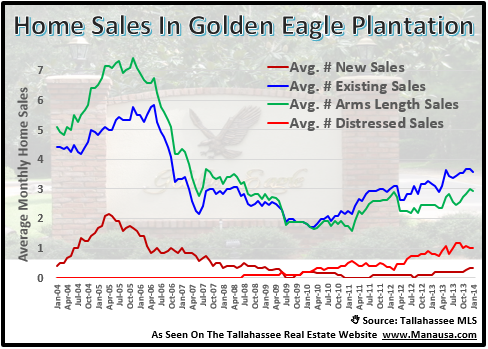 After a huge November and December to end the 2013 calendar year, home sales have finally slowed in Golden Eagle Plantation in NE Tallahassee. This popular neighborhood was grossly over-supplied with homes over $500,000, but a strong "year end clearance" has chipped away some of the excess of houses on the market in this Tallahassee golf course community. Through mid February, 2014, there has been only 1 closed home sale in Golden Eagle in the Tallahassee MLS. This is a very sluggish (but not completely unusual) start of the 2014 selling year. Currently, there are 29 homes for sale in Golden Eagle Plantation, and fewer than 4 are selling each month. Measuring at a buyer-favored 8+ months of supply, Golden Eagle's rate of sales rose last year as buyers took advantage of crazy low prices and historically low mortgage interest rates. This abundance of supply will continue to bring great opportunities for homebuyers, and with interest rates still just above 4%, excellent buying opportunities still persist in this popular Tom Fazio golf course community. The graph above shows that new home construction is still fewer than one home per month, while distressed home sales remain high at 1 per month. Consider this ...., more than 1 in 4 homes sold in Golden Eagle Plantation are short sales or foreclosures. 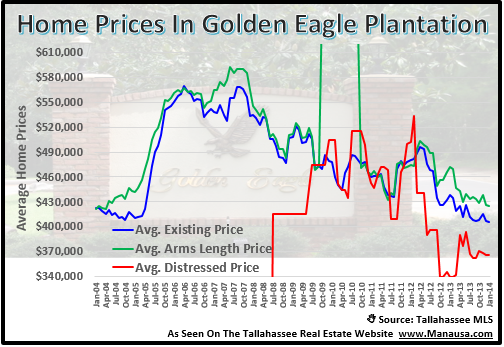 The average sales price of homes sold in Golden Eagle Plantation is on the decline. I believe this is the result of two key factors: Rising interest rates and rising distressed home sales. Currently though, interest rates have begun to fall again, so we might start to see buyers increase their spending limits. 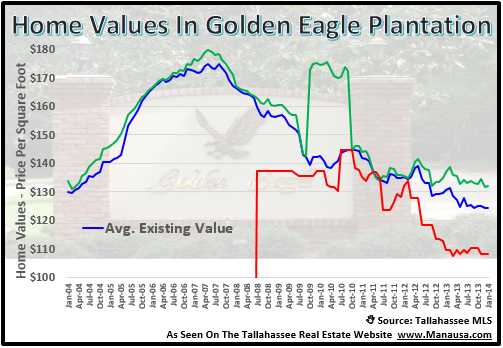 Real home values have not changed very much in Golden Eagle Plantation over the past 2+ years. While the blended average value is falling due to distressed home sales, arms length home sales have been fairly steady (at a 9 year low) since the beginning of 2011 (see the green line on the graph below). The following interactive map shows all of the homes for sale in Golden Eagle Plantation. Simply hover over a marker and a picture of the home will appear, as well as limited information on the home. If you want to know more about the home, simply click on the picture and the entire detail page will be revealed. I hope you enjoyed this Golden Eagle Plantation Home Sales Report, please drop me a note if you have any other questions or concerns that I can help you with.